We get questions all of the time from friends, family, even strangers that meet us and learn that we are designers. The questions can run the gamut from favorite paint colors to suggested curtain lengths (Dana touched on that last week). Because we often times hear simliar questions, we thought we should start to share them, as well as our answers, with everyone in a new blog series called Designer S.O.S. You guys are welcome to ask us too. Contact us via our website or our Facebook page and tell us your simple, but stumping questions. We'll answer as many as we can and share some of the more common ones on here to help others as well. Sound like a good plan? Good! Now let's get started with our first Designer S.O.S. question. My husband and I are newlyweds and just moved into our first place together. We're starting to decorate and purchase new items for our home, but I'm a little cautious about what to buy when it comes to certain pieces. Currently, I need tips for picking out a rug for our living room. What size would you usually recommend and should I be afraid of buying one too bold in color? As far as rugs go, I'd say go bold with pattern instead of color--at least for a first purchase that you'll want to use for awhile. Because rugs are investment pieces, you'll want something that you can use throughout the years even if you switch up the decor or move it to another room. I'm a big fan of natural fiber rugs (seagrass, sisal, jute...) because they bring in texture, wear well and can be dressed up or down depending on the space. They are also a great base for layering on smaller, more bold rugs. If jute isn't your thing, any neutral color rug would work. Remember it doesn't have to be a solid print--neutral, bold patterned rugs can transition just as well between spaces and can also bring a little interest to your room. 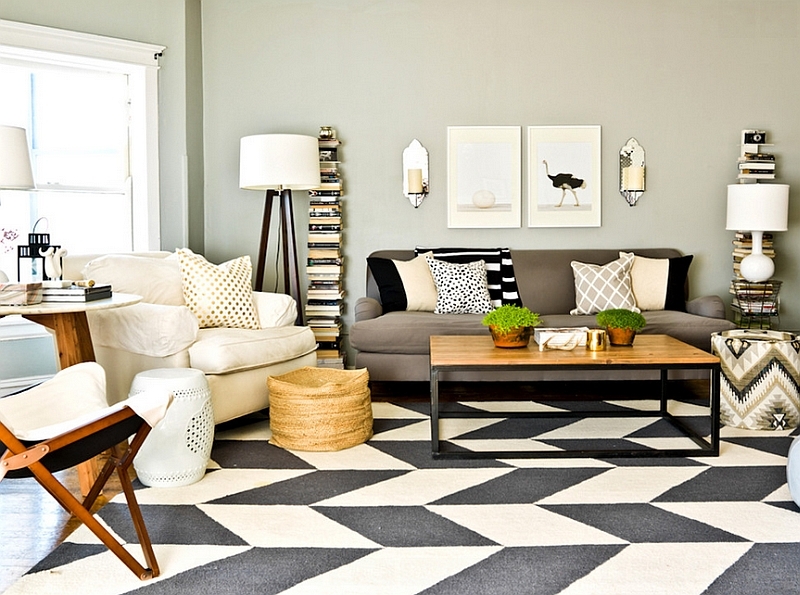 Every space needs some pattern and texture so don't be afraid to add yours on the floor! As far as size goes, unless you have a small room, I'd say skip the 5x7 and go for the 6x9 or 8x10. The bigger, the better. Anything too small will look insignificant and get lost in the space. A good rule of thumb is that you want all surrounding furniture to be able to have at least the front half of their legs on the rug (for example the front legs of a sofa or chair). The last thing you want is for your rug to look like it's floating in the middle of your furniture. In the end, you and your husband have to love it. So get what best represents you, and you'll enjoy it for years to come!